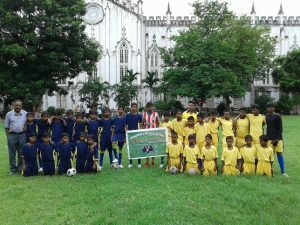 The serene grounds of St Paul’s Cathedral in Kolkata were transformed on 11th September into a football pitch! CRS established football teams for boys several years ago as a means of nurturing teamwork, giving children motivation and developing a sense of pride. A donation from Melbourne Parish Church in the UK earlier this year funded new kits and equipment for some of the teams. The most recent match was a friendly with 20 boys from G B Lane School in navy blue strips facing a combined team of 19 from Basanti Devi Colony and Sukantanagar school dressed in yellow. Both teams played well but B D Colony and Sukantanagar were the victors by five goals to nil. The spirit of friendship was high between the teams and they are looking forward to meeting each other at the next match. 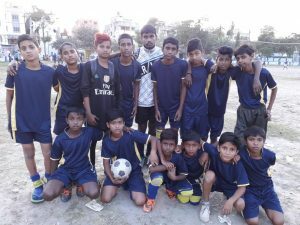 Following a service Melbourne Parish Church (Derbyshire) in November 2014, £500 was donated to support the football project in Kolkata. 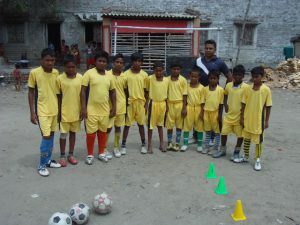 Teams from 3 CRS Education Centres received new kit: B D Colony now have a yellow strip, Sukanatanagar team play in green and G B Lane wear blue. In addition to shirts and shorts for all the boys, equipment was purchased including 10 new footballs, 40 coloured cones, 12 low hurdles and 2 ladders so that the boys can practice drills. Mohammed Aman, who studies in Class II at G B Lane school, said “Before we were playing with one ball, now have received 5 footballs. We are enjoying the game very much. We are pleased to have the new jersey.” He and his teammates found it strange at first to use the new training equipment as they were unfamiliar with it but now they are really enjoying football practice. Visit the CRS Facebook page to see pictures of the boys in their new strips and during training sessions.